Strike Industries AK TRAX-1/TRAX-2 KeyMod Modular Rail System/Tactical Handguard for Kalashnikov AKM Rifle/Carbine! | DefenseReview.com (DR): An online tactical technology and military defense technology magazine with particular focus on the latest and greatest tactical firearms news (tactical gun news), tactical gear news and tactical shooting news. 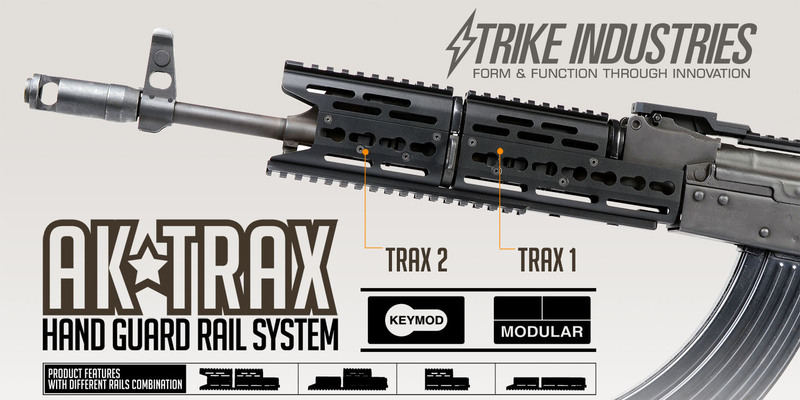 The Strike Industries AK TRAX-series KeyMod rails are finally available. The rail is very slim and light weight (only 3.6 oz!!) No more heavy and bulky AK rails! We provide a lot of different combinations, and the rail is totally modular. Comes with Black, FDE and Urban gray colors. KeyMod and KeyMod rail are included. Price at $89 for standard model. Add $89 for rail extension with long keymod rails! 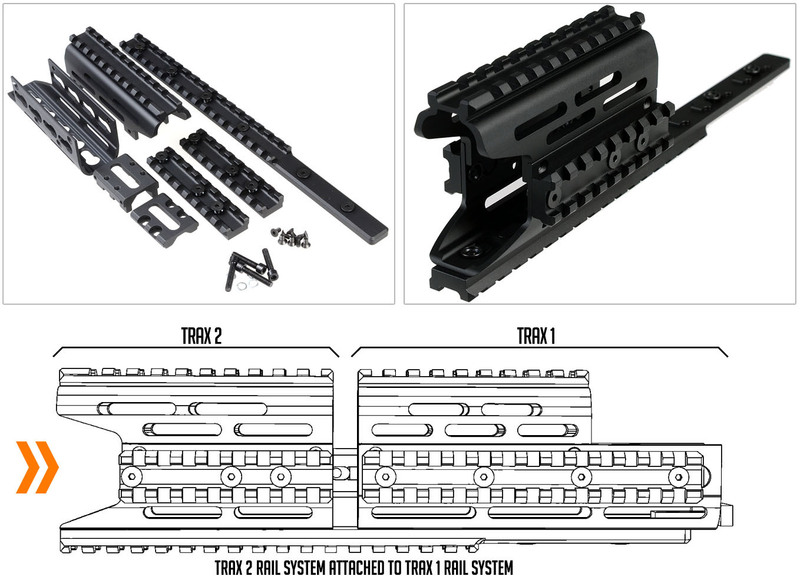 The Strike Industries AK TRAX rail system is a modular drop-in rail that is versatile, light-weight, and durable. Made from T-6, anodized aluminum, the TRAX will not add much weight to the front of your rifle. It provides the user with an adaptable platform for mounting various accessories to suit multiple purpose. The TRAX can be constructed in a number of configurations to give the user choices on how they want to set up their rail. Additionallty, by utilizing the keymod system, the user can add or remove rail sections at their discretion. The TRAX 1 section is the base rail system to which all other components attach. You can choose to utilize just the bottom section of the TRAX 1 or combine it with the top portion for a complete rail system. Made from T-6 anodized aluminum the TRAX 2 can be attached the TRAX 1 to expand the length of your handguards so that you may put on more accessories and grip father forward on the rifle for stability. The entire TRAX system can be assembled in a number of configurations to give a wide variety of options in configuring their rail system. Additionally, by utilizing the keymod system, the user can place rail sections for accessories at their discretion. The TRAX 2 section is the front rail that cover the gas block. You can choose to utilize just the bottom portion of TRAX 2 and leave the gas block exposed or connect the top portion to complete the entire section. Combining the TRAX 1 and TRAX 2 gets you the maximum amount of modularity and estate for your accessories!